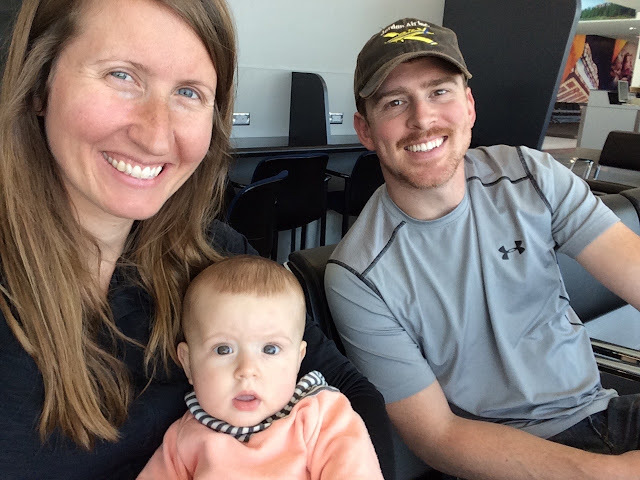 Before we left for our family vacation to Virginia, I started getting pretty nervous thinking about traveling with an almost eight-month-old. I was having flashes of scenes from movies where the baby scream for three hours straight while everyone around them makes faces. Due to layovers and whatnot, I have now successfully traveled with a baby on five flights ranging in length from 45 minutes to over two hours. We have also stayed overnight in a cabin for three days, taken museum tours, and road-tripped up to six hours in the car in one day. Basically I know everything there is to know about traveling with a baby. But I do have more knowledge about it than I did a month ago. Now, obviously this is just my experience with one particular baby. 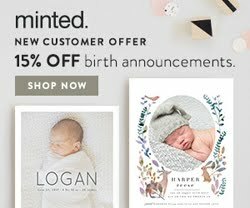 All situations and babies are unique, so what worked for me may not work for you, but hopefully this will be interesting and helpful to some of you! I will break it up by category to make this easier to digest. Also note: on this particular vacation I'm talking about, we flew United going there and American coming home and had similar experiences, so I would assume most airlines follow the same guidelines for babies. We knew we were renting a car once we got to Virgina, and since we didn’t want to pay an additional fee for renting a car seat from the rental place, we brought R’s car seat with us. Even if you have to pay to check a bag, they will check a stroller and car seat for free. 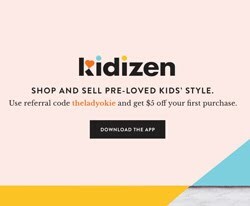 You just need to say, “We are checking this car seat,” and they will wrap it up in a giant plastic bag, give you a bag check tag, and send it down the conveyor belt on its merry way. We did not bring a stroller, but I assume it works the same way. You can also choose to bring the car seat and/or stroller through the airport, at which point you will gate check them before you get on the airplane. A stroller is handy to keep with you for obvious reasons if you have a larger child, but R was still small enough to carry in the Ergo Carrier at this point. We had a layover and didn’t want to deal with lugging the car seat around, which is why we checked it at the beginning, and we are very glad we did. When I bought our tickets off United, they specifically asked if there was going to be a lap infant traveling. R got her own set of boarding passes, but we did not have to show a birth certificate or anything for her. When we flew American home, R did not get boarding passes. On my boarding pass it just said “lap infant.” So I assume that is different depending on which airline you fly. I strapped R to me in the Ergo, and then we went through the security line. I took my shoes off, and I walked through the metal detector (with her still strapped to me). Then they swabbed my hands, and that was it! It was the same way coming and going, so I would think this is how they do it in most airports, although I’m sure there are some differences depending on where you are. Once we reached the gate, I laid a blanket on the floor for R to be able to stretch out on her back or stomach before having to sit on an airplane. She seemed to enjoy rolling and kicking. Or, depending on how much time we had, I would just keep her strapped to me and walk back and forth near our gate. You might also consider just unbuckling the carrier at this point and holding your baby, because once you get onto the plane it’s a small space to have to unstrap the carrier with the baby and deal with your carry-on bags. I think you just play that one by ear based on your baby’s mood. I’m sure this is personal preference, but I would actually consider not boarding first when they announce you can board if you are traveling with an infant. R seemed to be completely fine at the gate and walking onto the plane, but as soon as we sat down she started to cry. Maybe it was something about being confined in a small space or the fact that we were sitting down? Our tickets said Group 4, and I found it better when we waited to board in the later group than when we got on first. Less time for her to fuss before we started to move. On our very first flight, I was really trying to get R to drink milk during our actual takeoff, because I had read it would help her ears adjust. But as previously mentioned, once we sat down she was super fussy, and it takes a while for everyone to get settled, and then your plane has to taxi for a bit before taking off into the air. 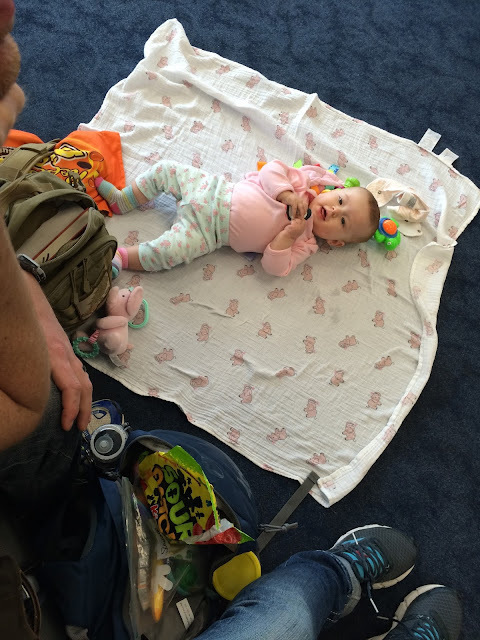 So I broke down and started feeding her early, and it helped calm her down on the airplane while we waited to leave. She didn’t act like her ears hurt on any of our flights during takeoff. I used a nursing cover, and I don’t think anyone even noticed what was going on. Nursing combined with being in a confined space, overstimulated from all the new things, and the movement of the plane lifting in to the air made her fall asleep almost as soon as she finished, and she stayed asleep for a good while once we were in the air. I did keep the nursing cover on to try and make it dark, although I held the top away from her face so she could get some air. -Eating part of a food pouch and/or teething wafers. -Eating some puffs. We fed them to her slowly one at a time, and these especially helped when she started getting fussy. It distracted her just enough to keep her calm. -Playing with the plastic drink cups. She oddly enjoyed throwing around the plastic cups. I kept my tray table down so they weren’t falling on the floor. -Playing with toys. We did bring a few of her favorite toys in my backpack, which she liked. -You might also try letting the baby look out the window. R seemed to like leaning against the window and looking outside. That should keep the baby’s attention for at least thirty seconds, anyway. Our first flight was the perfect ice breaker. We had a parent and kid sitting in front of us, behind us, and to the side of us. At one point, they were all crying, including R. (I think they all get each other riled up.) The worst offender was a three-year-old girl two rows back who spent the entire flight alternating crying with randomly making a loud high-pitched scream. We were just glad it wasn’t us. The truth is: if your baby decides to cry and you try to appease them to no avail, there is nothing you can do about it. We held her while she screamed and just didn’t look at anyone. And keep in mind: it’s actually not as loud as you feel like it is to anyone who isn’t sitting right next to you (but for real, sorry to those people). I went to the bathroom at one point, and in the back of the plane the screams of the various children were deadened when combined with the noise of the airplane engine, so take heart. -Enough diapers + wipes to cover your day of travel plus a few extra for emergencies (if your flight is delayed, etc). We did put some diapers in our suitcase, but we also planned on buying more diapers once we arrived at our destination. No need to fill up the suitcase with diapers if you can buy some later. -1 small pillow (that kind with the Styrofoam beads inside); this was great on the airplane when R fell asleep, because I could use it to prop my arm up on the armrest. R also liked playing with it on the plane. Not a necessity but nice to have. As you can see, that is a lot of stuff! We filled our checked suitcase with all the normal stuff—clothes, shoes, pajamas, underwear—for all three of us, and we also brought a bottle of baby Tylenol and Benadryl. The cabin we rented from Air B’n’B had a pack-and-play that we borrowed, and R did great. I followed a suggestion I had read online to bring the waterproof crib sheet we use in her crib at home so that the bed could smell somewhat like her own crib. Of course, if you co-sleep, then the baby just sleeps in your bed anyway and you don’t have to bring much extra! I hope some of this will be helpful to you if you plan on traveling with your baby and/or taking your baby on a plane at some point. I think it would work differently for older babies that are more mobile, but this is basically how it was for us traveling with an almost eight-month-old. Overall, I had a much more positive experience flying and traveling with a baby than I was expecting. I imagined people rolling their eyes at us for bringing our baby, but in my experience on this trip, everyone from the passengers to the flight attendants were really nice! I think the best advice I can give you is to be flexible. I went into this vacation determined to be as flexible as possible, and I really think that helped keep my expectations in check and helped me go with the flow more than I usually do. R and I will be flying by ourselves in June to visit a friend, and I hope it goes as well as it did on this trip! I will be following many of these same steps and will have to check back and let you know how it went! 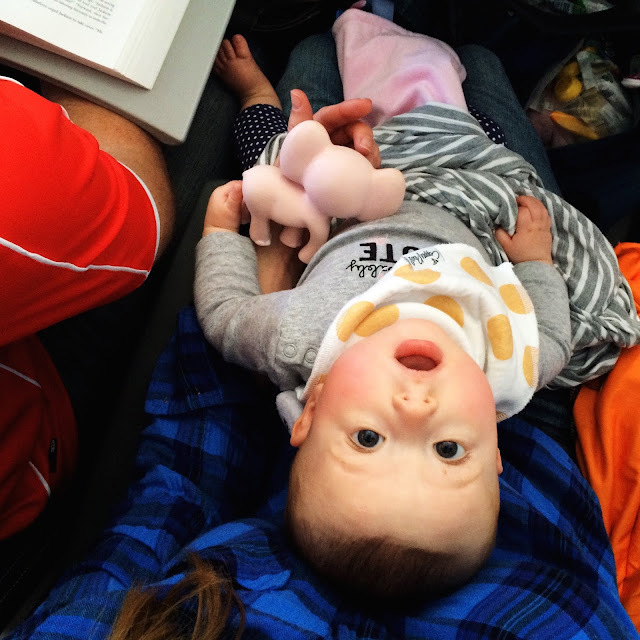 Have you ever flown with a baby? What advice would you add or change? 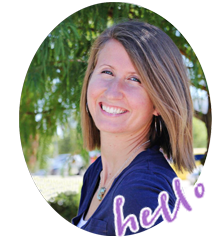 Is there anything that worked for us that worked differently for you? What questions do you have that I didn't cover here? All great suggestions! So glad it went well! Smart to buy throw away bibs. I've never done that--but will in the future. My answer to traveling once they are a little older is snacks. Lol. I flew with Gracie when she was just shy of 6 months, and we did all the same things. I agree completely. We checked the carseat all the way through and gate-checked the stroller, though I've heard some airlines have weight restrictions on gate-checking strollers, and they need to be under 20 pounds. We could check the carseat for free, but they made us pay for our pack n play which was annoying. Overall, I think the anticipation of flying with a baby was so much worse than actually doing it. 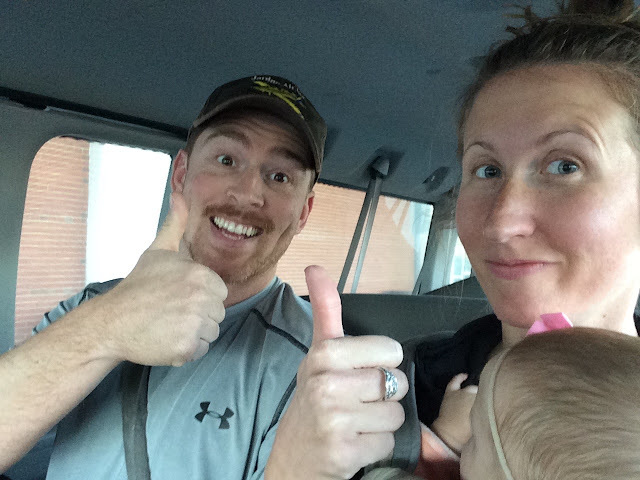 She barely slept on the plane and had a few fussy moments, but overall it was so much easier than I was expecting. These are great tips! 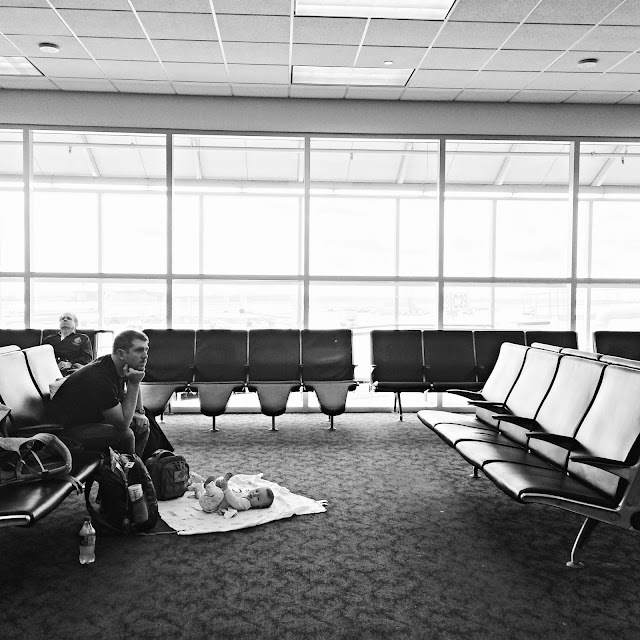 I haven't flown with a baby, but we drove to Florida with Amelia at 7 months (a 19 hour drive -- ugh), and a lot of the same things apply, minus having to keep her happy to please strangers around us. Sidenote, when did you start giving her puffs? I feel so behind on the food thing. She's still barely eating purees! We started giving her purees around 5months, but it took her a whole month to get the hang of it. She would act interested in them but just wasn't sure how to eat... now she eats a ton! I think we will start doing table food now (8.5 months) because she seems to be doing really well with the purees. We gave her puffs around 7 months maybe? We don't give her a lot. They are mostly used as a last resort to keep her happy and not as an actual meal. Keep in mind, we have NO idea what we are doing on the food thing and are totally winging it. It's stressful! I agree with everything you said except for not boarding early. I takes me a while to get settled, forget about Parker, so I like all that extra time to get in before I'm elbowing my neighbour. I'll be flying with an 11.5 month old in a few weeks and I'm way more nervous. He'll want to crawl! Make a big food mess! Put everything in his mouth! Eek. That makes sense. It just seemed like she started screaming as soon as we sat down, and it was stressful for me to handle that while people were still getting on because that takes a while. You are a champ! Saving this for when we fly with Jack. Sounds like R is a champion traveler!! Good tips. I will definitely have to tuck this away for later! I always feel badly for parents whose babies are crying on a plane because I know there just isn't a lot they can do about it (because it's clear they are trying everything) and they are constantly apologizing to everyone around them. Like you said, the crying isn't as loud as people think it is. I'm not saying that I want to have a screaming infant next to me for 2 hours, but I do think it's good to have a little grace for parents who are in that situation. And honestly, in all the times I've flown, I've never seen someone be unkind to a parent with an upset child. I'm sure some people are annoyed, but at least in general, people are understanding (or act like they are, ha!). Holy cow girl you ARE an expert!! I'm so glad you've had great experiences with traveling. That's really nice they bag up your car seat and check it like a normal bag! :) thanks for sharing the tips! I'll need 'em one day! I agree with 98% of your advice (and we just flew 6 flights with E, 3 months old, ranging from 4 to 12 hours). My biggest caution would be checking car seat: Be aware that if your luggage gets lost or left behind, you could be in trouble for a car seat. We checked our car seat (also actually the sitting part of the stroller for E while she's an infant) on one flight - the flight in which 2 of our checked bags got lost. Fortunately the car seat made it, but had it not, we would've had to do some fancy dancing. Depending on the situation, it might be worth the risk - but sometimes, it might not be. We felt that gate check was more reliable. Also, on longer flights, the attendants seemed quite happy to let E and I walk the aisles, stand in the galley, etc. She's an extrovert so loooooved seeing so much and interacting with so many people. But that probably depends on baby and situation. Good point! 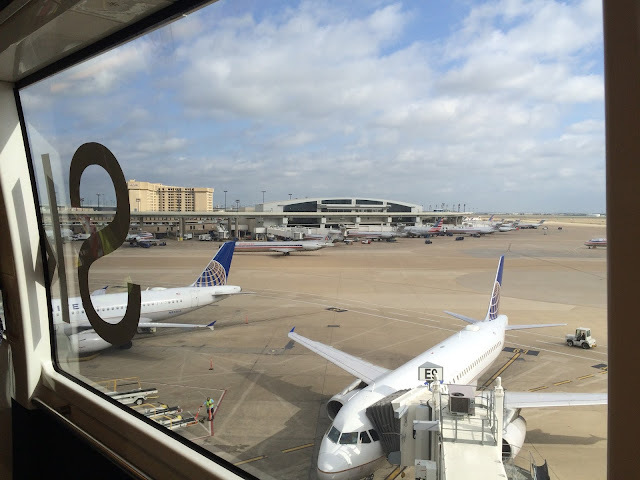 We did think about that, but our longest layover was only an hour and we were flying through very large airports so we didn't want to have to lug the car seat along with our stuff and R on a possible sprint to our next flight if something got delayed. But for sure that would be something to consider! Flying with a baby seems like so much work! This might be terrible to say but I have to disagree with you that you can't hear a baby screaming loudly on a plane. I feel like you can hear them no matter where you sit. It is annoying but at the same time it isn't anyone's fault so if I'm sitting by a crying baby I try to offer to hold their kid because I just feel bad for parents. And people who glare and get mean about it are just rude!!! Whenever we flew international I always felt bad for parents with kids. I mean 14 hours with kids??? Those parents deserve a gold medal or something. I'm glad it overall went well for you and I'm glad R is a good traveling baby. this is super informative. i didn't know you could check strollers or car seats. interesting. when i was younger, i hated people with kids when i flew, but then i grew up and got a wee bit more understanding. i was on a flight from LA to sydney once and the baby next to me cried the whole time. the mother was so upset and kept apologising, but the baby was super young and honestly, there was nothing she could do. i've been on other flights where parents let their children - not babies or toddlers, but like 6 and up - run all over the place and throw tantrums, which i don't forgive as easily haha. but honestly... just like any public place, there are people and sometimes people make noise. or whatever. i hate when people get mad at other people when it's completely out of their control, like a baby crying. c'mon, that's what babies do. 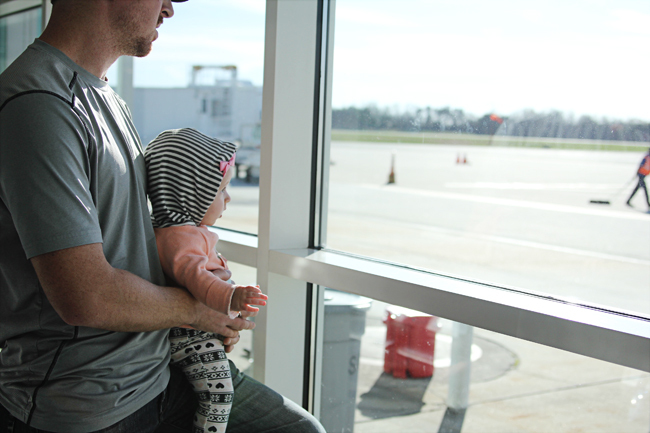 I've never traveled with a baby, but we have flown with a toddler. Fun! We have a Britax convertible carseat, and Britax makes a little stroller-type thing that it can buckle into so you can roll it through the airport. That was super helpful when we had to run across the airport to make it to our connecting flight in 20 minutes! We also brought it on the plane for Em to sit in - I was paranoid that it wouldn't make it to our destination. But I think she was also more comfortable that way - except that the person by the window is pretty much stuck there for the entire flight since the car seat takes up so much room. Empty that bladder before getting on the plane! Glad you had a great experience traveling with R the first time. I'm sure there will be plenty more fun adventures! I've never understood why they invite families with small children to board first. Why? So they have even MORE time besides the upcoming 3-hour flight to sit in their tiny assigned space and get board? If I ran an airline, I'd offer parents the option to wait until the plane actually starts rolling away to sprint down the tarmac and take a flying leap on board at the last possible second. Which is probably why I don't have my own airline. Traveling anywhere with a baby is so much work! But I think your suggestion of be flexible is the best way to put it and then it's really not that bad. I haven't flown with a little one but we drove from MI to KY straight through with her around 8 months and that was interesting. It went better than I thought though! And your right, I thought people would think we were ridiculous traveling with a baby but most people are really nice about it! Next year we're travelling from the UK to Florida with baby who'll be only 3 months old and i'm already dreading it... needing all the tips I can get!